How Can Older Adults Safely Use Social Media? Many people think of social media as something for younger people, but it can be an important part of a senior’s life as well. 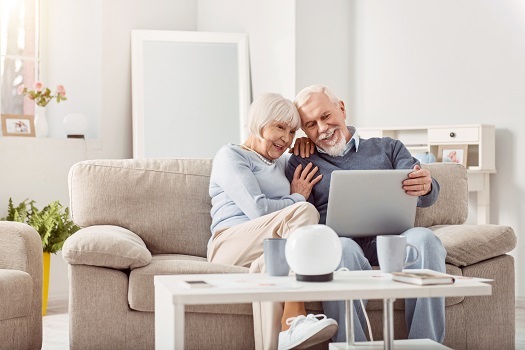 Social media allows seniors to socialize, keep up with their favorite businesses, follow the news, play games, stay connected with friends and family members, and reconnect with people from the past. If your senior loved one is using social media, here are a few ways he or she can stay safe from online risks. Seniors are often the biggest targets for various types of scams, so it’s important to eliminate this risk as much as possible. If your loved one has concerns about privacy, show him or her how to double-check the settings when you’re not around. Explain who can and can’t see the content your loved one posts online. Online fraud is not the only risk older adults are susceptible to. Seniors can face a variety of challenges as they age, many of which can be mitigated with the help of professional in-home caregivers who provide high-quality home care. Winnipeg families trust in Home Care Assistance to help their elderly loved ones age in place safely and comfortably. It’s a good idea for your loved one to understand what not to post about other people. Your loved one may mean well making announcements about friends. However, it’s always best to ask people before posting anything on their behalf, which includes tagging people in posts. It’s fun to post vacation pictures or tell everyone your family is throwing you a birthday party at your favorite restaurant, but make sure your loved one understands that posting exact location information can be a safety risk. Burglars may see your loved one isn’t home and attempt to break into his or her house. A better idea is to show off those holiday pictures once the trip is over. Talking to friends online is a great way for seniors to socialize if they have issues getting out of the house due to disability or an inability to drive. However, it’s important for your loved one to stick to people he or she already knows in person. If your loved one is interested in talking to new people, help him or her find a safe outlet to do so. Teach your loved one that scammers may pose as regular people to gain trust and information they can use against them in the future. For families living in Winnipeg, respite care can be a wonderful solution when their aging loved ones need companionship and socialization a few hours a week or just need minor assistance with daily household tasks. At Home Care Assistance, we thrive on helping seniors maintain their independence while living in the comfort of home. Social media websites do not ask for personal information such as bank account info and social security numbers. If another user asks for personally identifiable information, it’s most likely a scam. Make sure your loved one knows not to post personal information and to leave a conversation if the person or website asks for it. Many seniors use passwords that are easy for criminals to guess or hack. Make sure your loved one understands how to create a strong password with letters, numbers, and symbols. It may be difficult to remember a password, so write it down for him or her in a safe place where no one else can access it. As with other personal information, make sure your loved one knows never to give the password out to anyone. Using social media is just one of the many ways seniors can receive social stimulation and boost their overall quality of life. If your elderly loved one needs help maintaining a high quality of life while aging in place, reach out to Home Care Assistance, a trusted provider of Winnipeg senior home care. Our caregivers provide transportation to and from medical appointments and social events, nutritious meal preparation, assistance with daily exercise, and help with everyday tasks like bathing, grooming, and light housekeeping. To create a customized in-home care plan for your aging loved one, give us a call at (204) 489 6000 today.